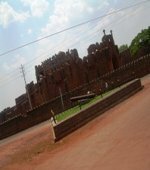 Bidar Fort - It was built by Ahmad Wali Shah in 15th Century. This Fort has five gates with imposing bastions lead into a little town nestling within the ramparts. The fort occupies a promontory that is defended by double rings of walls and a moat partly carved out of the bedrock. In the center of this fort is the old city with its monuments and structures, belonging to the Bahamani era. There are important palaces like Rangeen Mahal, within the ramparts of the fort. The fort is one the largest and strongest forts in India. The other places for Bidar attractions are Bahamani Tombs at Ashtur - The outer walls are decorated with tile mosaic art, and the interiors are adorned with well-preserved paintings that are excellent examples of medieval Muslim art. 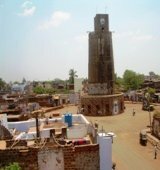 Bidar Tower Clock - Situated right at the centre of Bidar city is Chowbaara, the 70 feet tower. From the top of the Chaubaara, this cylindrical structure gives a commanding view of the entire city of Bidar. Another great Bidar attraction is Gurudwara, at the hill foot of Bidar. Gurudwara Nanak Jhira Sahib, Bidar is dedicated to the first Sikh Guru Nanak Devji. 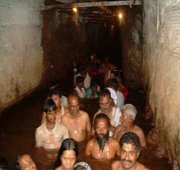 It is believed that Guru Nanak - the first guru of the Sikhs visited this place and got rid of the scarcity of drinking water in the region. 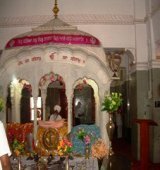 It includes Darbar Sahib with an exquisite palanquin made up of marble, Diwan Hall and Langar Hall. There is a separate rest room for Guru Granth Sahib known as Sukhaasan Room and a Likhari room. A stream of sweet water flows from inside the hill. Gurudwara Nanak Jhira Sahib, Bidar is a very sacred place and offers peace and wisdom to all its visitors. 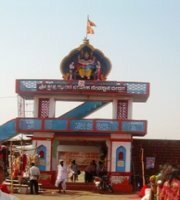 It is said that one can see snakes guarding the idol especially during Shivarathri festival (celebrated sometime around February). Madarasa of Mahmud Gawan: It is one of the oldest universities (built in 1472,) which was founded by by Khwaja Mohammad Gawan, the Prime Minister during the reign of Bahamani ruler Muhammad-III. This university was once a renowned centre of learning in the Muslim world for the scholars of Persian, Arabic, philosophy, theology and mathematics. By Rail: Bidar is connected by well maintained rail network running to Hyderabad and Bangalore. One can also travel to Gulbarga city from where take a bus to reach Bidar within one and half hours. By Road: Regular luxury buses run from Bangalore via Hyderabad on NH 7 and NH 9; the journey takes nearly 16 hours. Did you like this page? If so, please don't forget to like our Facebook page on the right side.